Following last October’s 70th anniversary concert, a smaller-scale Singing to Survive event is taking place in Chichester on 17 May 2014. 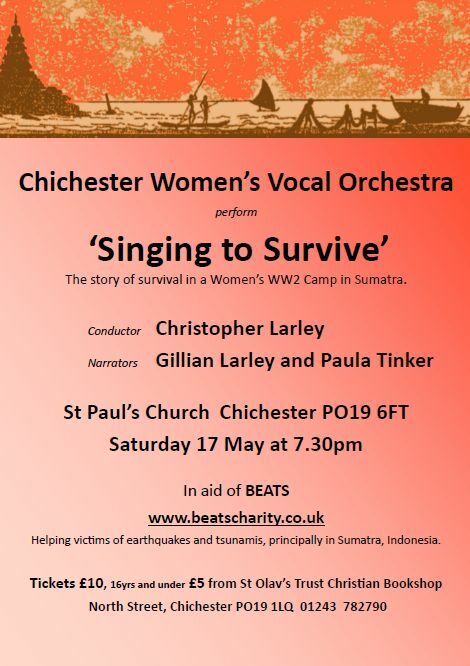 Once again the stunning Chichester Women’s Vocal Orchestra is performing the music first arranged and sung in those Sumatran prison camps back in 1943, while the inestimable Margie Caldicott, daughter of prison camp survivor Shelagh Lea who sang in the original choir, is organising the event. The venue is once again St Paul’s Church, Chichester. The evening promises to be very special indeed. Tickets are available from St Olav’s Trust Christian Bookshop in Chichester (01243 782790). This concert was amazing, I can’t wait to see it again next Saturday. Really need aCD so I can listen to it any time.